If you’re hitting the road this summer weekend and planning to commute to the Snoqualmie Valley via eastbound Highway 18, you will need to plan ahead (use alternate route), as a 3-mile section the busy I-90 connector highway will be closed all weekend. A multitude of pavement repair professionals will descend on eastbound State Route 18 for a weekend of concrete and asphalt fixes in the Auburn area. starting Friday, July 26, 2013. All lanes will reopen just after sunrise Monday, July 29th, welcoming drivers and freight-haulers to a smoother ride. Beginning at 8PM Friday, contractor crews will close most of eastbound SR 18 between SR 167 and Southeast 304th Street to resurface the eastbound Green River Bridge and rebuild a 200-foot section of highway approaching C Street Southwest. All lanes will reopen in time for the Monday morning commute. All eastbound SR 18 traffic west of SR 167 will be diverted to SR 167. No through traffic allowed on eastbound SR 18 between SR 167 and just west of Southeast 304th Street. 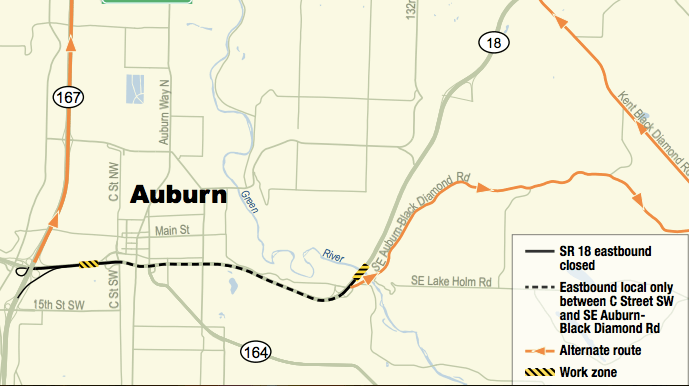 Local access only on eastbound SR 18 between Auburn Way South and Southeast Auburn-Black Diamond Road. Northbound and southbound SR 167 off-ramps to eastbound SR 18 closed. C Street Southwest on-ramp to eastbound SR 18 closed. Southeast Auburn-Black Diamond Road on-ramp to eastbound SR 18 closed. For more information on the SR 18 project and alternate routes during the closure, visit the Washington State Department of Transportation website.